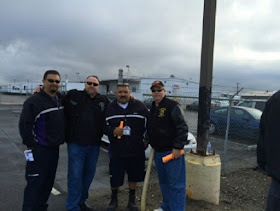 Local 439 members in Stockton, Calif. leaflet at Fed Ex Freight. The Teamsters joined with thousands of truck drivers, valet attendants and low-wage workers across the country today in a day of action to raise awareness about the sorry state of wages and benefits for millions of everyday Americans on the job. FedEx Freight employees, port truck drivers and fast food workers held protests from coast-to-coast. They are joined by Teamster valet attendants at the Hard Rock Hotel and Casino in Las Vegas, who are rallying tonight, and federal contract service workers in the nation’s capital on strike to call out employers who won’t pay fair wages and tamp down on workers organizing. From Baltimore to Seattle, Teamsters stood outside more than 300 FedEx Freight terminals educating workers about the company's spending of $5.2 million over the past three years to cover the personal taxes of top executives as well hundreds of thousands of dollars to wage anti-worker campaigns. Meanwhile, workers there continue to have access to poor and expensive health benefits. FedEx Freight workers across the country have been building their power with the Teamsters' help for many months. Workers have committed to fighting for the long-haul to attain their true goal of a collective bargaining agreement with their employer. FedEx Freight workers want a voice and they want it in writing. Workers are overcoming their fear and the companies constant assault on organized labor. This workforce has built a very large core of committed individuals and continue to grow their pro-contract, pro-union, pro-Teamster ranks daily. They all understand that this is a marathon and not a sprint and are working diligently with their goal of memorializing their working lives in a written agreement with FedEx Freight! 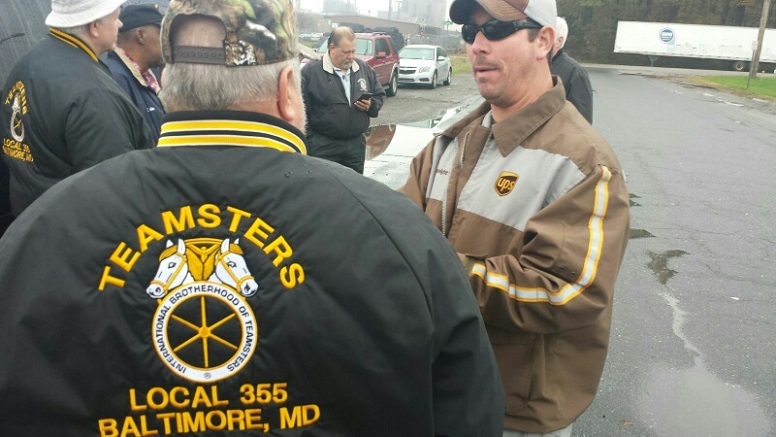 Local 355 Teamsters gather in Baltimore. Those efforts were repeated elsewhere. Port truck drivers and their Teamster supporters turned out in Los Angeles, New Jersey and Savannah, Ga. to raise awareness about wage theft and misclassification. These workers have been fighting to be recognized as full-time employees rather than contract workers. The Teamsters have stood shoulder-to-shoulder in recent years with FedEx Freight workers and port truck drivers in an attempt to expand their voice in the workplace. That effort extends to valet attendants at several Las Vegas hotels as well as other disenfranchised workers across the nation. The Labor Department’s own statistics prove why joining a union is important. The median union worker earns more than $200 a weekmore than a non-union one. That’s why the Teamsters have stressed the importance of labor membership in our recent “Let’s Get America Working!” campaign.